Sauna is an Apocalypse Now-esque tale of darkness and the inescable path to reckoning that is both pretentious and masterful, boring and thrilling. Finland's Antti-Jussi Annila gives us Eerik and Knut - two brothers sent by Sweden to mark the border between Finland and Russia after a quarter decade war over the church has reached it's end. Along their expedition, the brothers take shelter with a widower father and his teenaged daughter. Upon discovering the hidden religion of the quaint family, the older - and much more brutal - brother Eerik is seen stabbing the father to death (for untruthfully reaching for an axe). 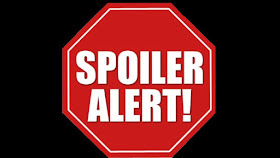 To protect the survived daughter from Eerik, the younger - and more sheltered brother - locks her in an underground cellar. As the trek continues off the property, Knut is haunted by the visions of the girl they have abandoned to die. Further on a swamp is reached that they must divide to each country. In the middle of the swamp a small uncharted village is stumbled upon - a village of 73 - an amount equal to lives Eerik has taken...and those that need to be avenged. 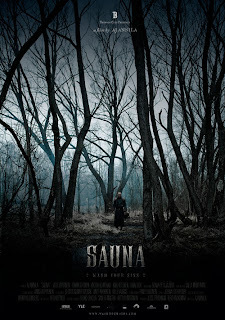 With eerily mirrored parallels to Vinyan (2008), Sauna is an emotional and pyschological journey to the inner depths of fate and hell, and not unlike the ever brilliant Ravenous - filthy, cold, and thrilling. The cast is captivating, the script is fantastic, and the setting, scene locations and photography are beautifully unclean. 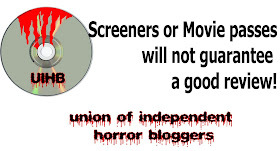 The lack of gore and slow pacing found here are not for the average horror fan, but those well versed in the films of inner horror or period horror will find Sauna well worth the short running time.